View More In Kids' Bikes. 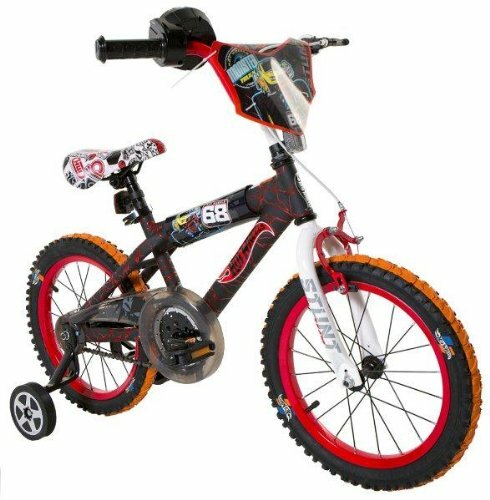 Hot Wheels fans will love riding around on this 16" BMX boys bike featuring a sturdy steel frame with a colorful design and authentic Hot Wheels graphics. This bike includes front hand and rear coaster brakes making it easy to stop. It also includes a handlebar/crossbar pad, adjustable/removable training wheels, adjustable padded saddle seat, and Rev Grip which make this a stylish ride for your Hot Wheels racer. Hello Kitty Girls Bike with Light Up Case, White/pink, 16"